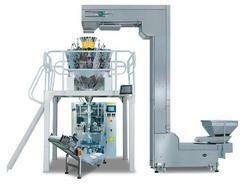 Pioneers in the industry, we offer rice packing machines from India. Capacity 200 gm - 2 Kg . We have constantly roused our group to be a piece of nonstop research and market advancements in this way our offered item Rice Packing Machines accompanies and thorough tests to give high review results and consumer loyalty. This naturally gathers rice and loads them into the containers with steadiness and fast.